A couple months ago I saw a blog post about the history of aprons, and it completely resonated with me. I have tried to find it since and have been unsuccessful. Unfortunately I cannot credit that writer, but it did trigger this post. Years ago, aprons were standard in every household. Every grandmother, mother, & daughter would don them while working in the home. They helped carry in produce from the garden. They wiped away the tears & blood from many children. They quickly dusted off old furniture or dishware when unexpected company arrived. They protected clothes when many women had a limited wardrobe. So much of this tradition has been lost. I always remember my mom wearing an apron while in the kitchen growing up. Particularly if she was dressed up for a holiday or if guests were coming over and she didn't want to ruin the fancy clothes she was wearing. The apron was such a part of her. A part of what made her "mom'. I can remember being her little helper in the kitchen and carefully choosing which of her aprons I would get to wear. They usually fell to my feet, but it didn't matter. In that moment I got to be just like her. I would dream about the days that I would have my own kitchen and be whipping up meals for my own little family. And yes, I have seriously wanted to be a stay-at-home-mom since I can remember! So here I am; cooking for a family of three and loving every minute of it! I have three aprons hanging up in my pantry, and while they don't get worn nearly as often as they should, when I put one on the nostalgia hits me! Now that I have a little one, I appreciate that apron even more. It truly does catch that chocolately handprint that otherwise would have landed on a pretty dress. It wipes away the tears from a bad fall. It cleans up a runny nose. It catches the drips from hot summer popsicle. It gets splattered with a drop of wine (or two). And it is eventually covered in all the flour & sugar that dusts me & countertops while I am making some of my mom & grandmothers' recipes. Liam is finally at the age where he can actually help me with meals, so cooking has become one of my favorite activities again. 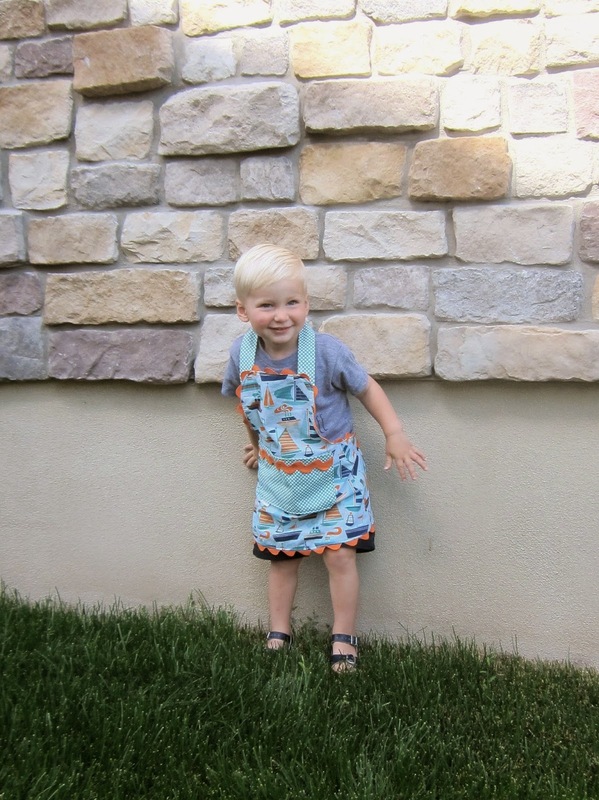 And since little L loves to imitate Conor & I, he was ecstatic when he received an apron of his own! 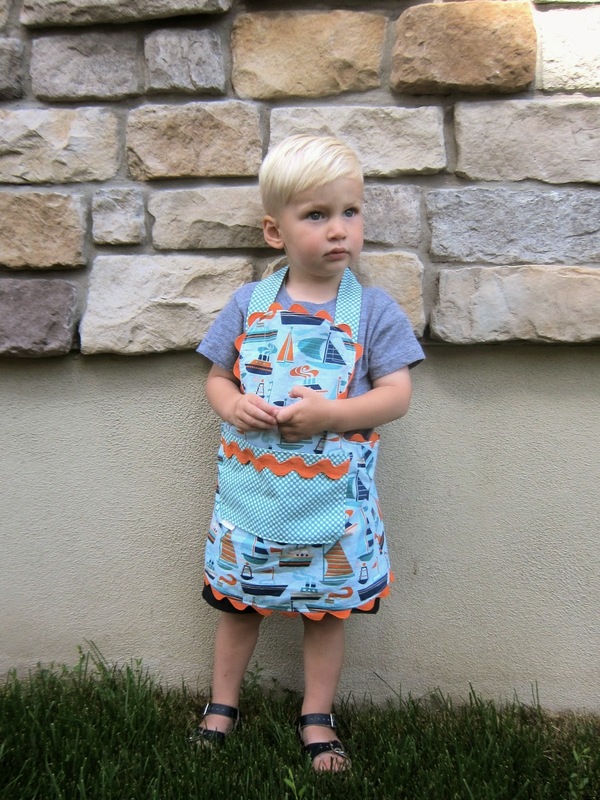 My sweet friend Jenn recently opened up her own etsy shop (Jenn D. Design) where she sells her aprons along with other goodies for babies & little ones. 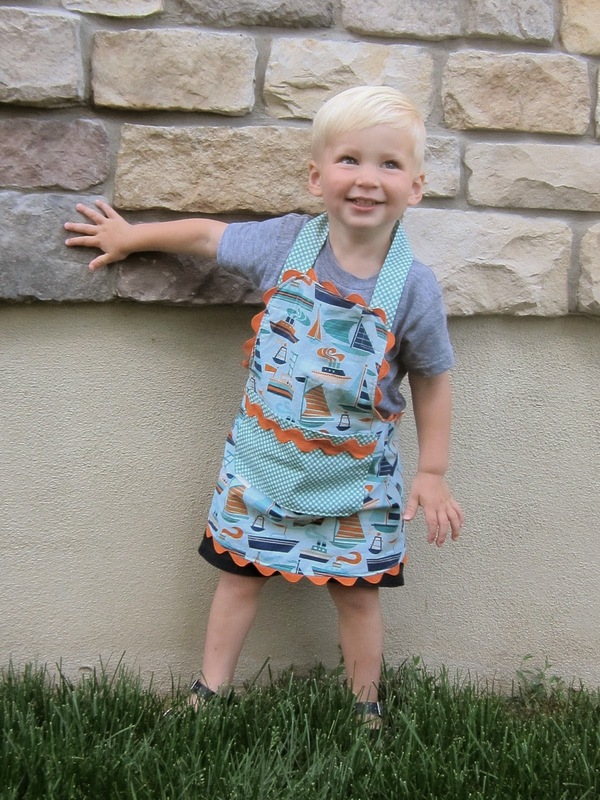 I am absolutely in love with this boat fabric, as is Liam! For the girls, I love this purple one! What stands out the most about her aprons are the quality & craftsmanship; Liam's apron is flawless. And it's so damn adorable! I barely handle the cuteness that is a teeny tiny apron! Little L was a bit hesitant to wear his at first, but once he realized it was just like Mama's...he was all about it! He wanted to wear it all day, every day for a solid week! 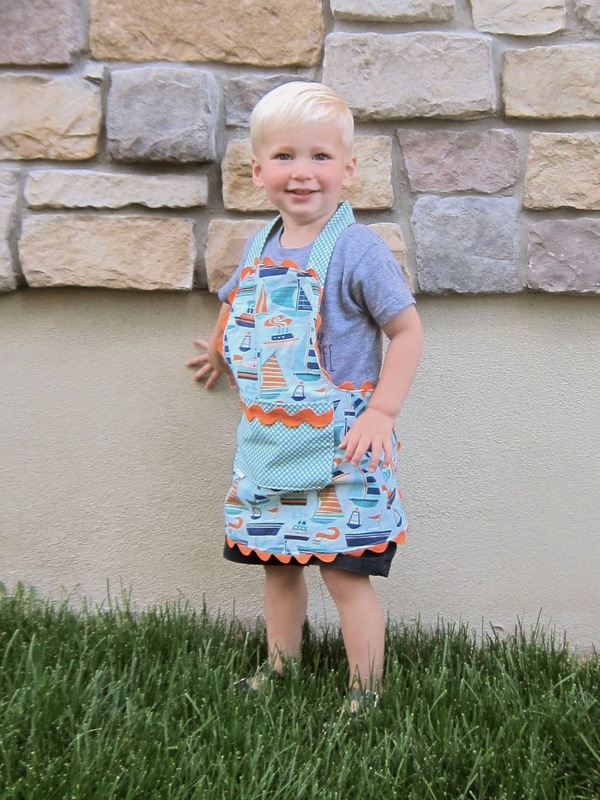 His apron has already been on many an adventure, helped to prepare some snacks & meals, and it is still in great condition! I think these are the perfect gift for a little sous chef in the making! Yay for traditions and yay for supporting handmade goods & small shops! aw so cute! i must say, i dont have lovely memories of aprons like this, my nana or mother never wore them, but i think its lovely that you still do! So sweet! I loved reading this post. You reminded me of how my mom and grandmother would wear their aprons on a special occasion when they were all dressed up for company and didn't want to get messy as they put the finishing touches on the meal, just like you said. I actually only have one apron, a red and white W&S one Keith gave me after we got married, and I honestly only wear it when we're baking Christmas cookies or preparing a TG / Christmas dinner. Thanks for reviving my memories!! how unbelievably adorable!!! So true about the apron, but something I've never really thought about. I should definitely wear mine more often, esp when making red sauce. Can't keep that stuff off of me. Mommy and me aprons!! I love it =) Would be such a fun way to make Christmas cookies too. I'm getting carried away in memories both old and to be made now...great post!